TV advertising revenue in 2017 fell 3.2% from the record £5.3bn haul enjoyed by the UK's commercial TV broadcasters in 2016. However, commercial TV trade body Thinkbox, which collects the figures, claimed that "growth is now returning", pointing to a spending increase of around 2% in the fourth quarter. Thinkbox counts all money invested by advertisers in commercial TV across all formats and on any screen: linear spot and sponsorship, product placement, broadcaster VOD, addressable and interactive. The last year that TV spend dropped was 2010, when advertisers were pulling in their horns after the global financial crisis hit consumer spending. Thinkbox attributed last year’s drop to "ongoing economic and political uncertainty, with a weakened pound and inflationary pressure leading some advertisers to reduce TV investment". Spending was cut particularly in the ‘food’ category, which covers food producers and retailers and is the second-biggest category, according to Nielsen. It attracted £559m, which was 11.4% lower than 2016. However, it grew by 1.2% in the fourth quarter. Thinkbox was also able to point to the growing cost-effectiveness of the medium and a host of new and returning advertisers. In 2017 the average cost per thousand for TV-set ad views (100% viewable, played through from start to finish at normal speed) was £5.06, 4% less than 2016 and 28.6% cheaper in real terms than 10 years ago. Nearly 800 brands advertised on TV for the first time or returned to TV after a gap of at least five years. Lindsey Clay, chief executive of Thinkbox, said: "Post-recession, TV advertising in the UK had seven consecutive years of growth. But TV hyper-reacts to the economy, good or bad, and recent uncertainty saw growth stall in 2017. That growth is now returning. 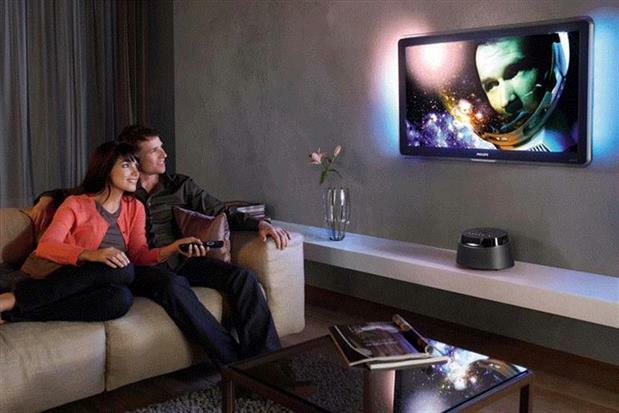 "The pendulum is swinging back to TV. We have more proof than ever that TV advertising drives business growth and outperforms all other forms of advertising. TV is a proven, trusted, high quality environment for brands. "And TV’s strengths and unique assets have been thrown into even sharper relief recently following the much-publicised scandals and loss of trust in some areas of online advertising. Advertisers are re-assessing where they advertise and TV is well placed to capitalise."